Way back in November 2009 I posted here about having my solar hot water panels installed, and in February last year I posted about my solar electricity panels. These had their anniversary last week, so I thought this was a good time to post an update. The view here is of the back of my house﻿, which faces east-west. There is a similar arrangement of both types of panel on the front roof. The solar thermal panels (hot water) - on the right here - performed extraordinarily well last year. From early March to late October I didn't use any supplementary water heating at all. During June, I had so much hot water that I felt I should set up a shop - I couldn't possibly use it all! Given that my hot water is otherwise heated by an electric immersion heater (my gas-fired central heating is ducted warm air - no 'wet' system anywhere), this represents a huge saving in electricity costs and associated carbon emissions. In recognition of this, my energy company (Good Energy) gives me a renewables obligation payment (HotROCs) of just under £100 a year, which is paid as a credit on my electricity bill. My solar photovoltaic panels (electricity) - on the left in the picture - have a design estimated production of 1904 kWh per annum. This calculation is based on the area of installed panels, the specific technology of manufacture, the compass direction they face, the latitude of the house, and the angle of the roof. My installers told me that, in their experience, the panels perform better than the given figure - but they aren't allowed to quote that formally! They reached their design figure in November, in nine months. Either side of the winter solstice is the least productive time of the year (and for two weeks they were covered in frozen snow), but in the remaining 3 months they put on an extra 5% and made it to 2000 kWh exactly on their anniversary day. The combination of electricity saved and electricity generated makes my house now roughly electricity-neutral over a 12-month cycle. Of course, this is an average over substantial seasonal variation. 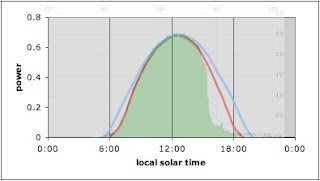 The solar gain (either thermal or PV) varies over each day and varies over the year. The two principle variants are the length of daylight, when the sun is shining, and the angle at which the sunlight strikes the solar gatherers. Overcast days will diminish (but not eliminate) the effective solar power. This graph shows an example of the variation in solar gain over a day, with the maximum being at local solar noon. and then click the back arrow to return to the blog. The graph above shows actual data from a domestic system installed in Britain. You can see how the maximum output is either side of the summer solstice, while the minimum is either side of the winter solstice. In any particular year, specific weather conditions will change this pattern a little, but the basic shape remains the same. 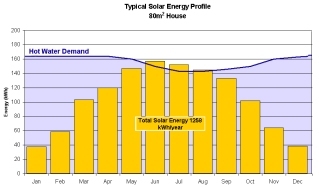 This graph shows a typical profile of how solar thermal gain varies over a year, compared to hot water requirements. The pattern of gain through the year is the same as for electricity generation. 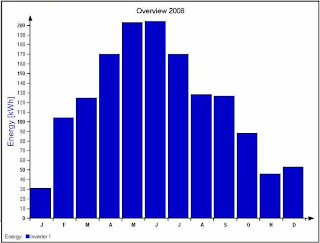 The graph also shows an excess of gain over demand at the height of summer, as I wrote above about my own system. You can also see a descriptive and technical discussion of a bigger installation on a church in London, at St James's Piccadilly. The bureaucracy of the new Feed-in-Tariff (FiT) has taken its time . . . Within the next couple of weeks I will receive the first payment (direct into my bank account) for the electricity I generated between April and December last year. From then onwards, the payment will come quarterly. The FiT scheme has not been universally welcomed. Some have seen it as a powerful incentive for people to install domestic solar PV, thus increasing the amount of electricity generated by renewables, and boosting the domestic renewables industry. It has certainly created work for installers, but not for manufacturers. For a complex set of economic reasons, Britain is importing most of the equipment being installed. My own panels came from China and the electronic control units came from Germany. In financial terms, the FiT reduces the pay-back time from, typically, 20 years to 10 years. This may increase the number of people going down this route for financial and not primarily environmental reasons. There are now large companies who will effectively 'rent' your roofspace, if your property is suitable. They bear the capital cost of installing the panels, you get the electricity but they get the FiT. With bank interest rates so low at the moment, this represents a way of getting a good return on their capital. Concerns are now being expressed about such companies hoovering up all the FiT money, and depriving householders of the incentive it was designed to provide to them . . . expect to see a change in regulations fairly soon! My own view is that the energy companies (without FiTs) should be installing the panels (thermal and PV) on willing customers' roofs, taking the surplus energy for specified time to defray costs. The energy companies could do this on a scale that would hugely reduce installation costs, and, if mixed in with other investments (such as wind, wave, etc), could be an alternative to a new power station. The technical problem with this is that our electricity distribution grid is not designed to cope with this on a large scale. It's designed to handle a relatively small number of large inputs, not huge numbers of small generators. The grid needs re-engineering and rebuilding anyway - it's old and creaking - so this would all become part of one large infrastructure project. The error made with FiTs, I believe, is that some of the conditions that pertained in relation to the old grants system, that the FiTs replaced, have been dropped. Under the previous regime of capital grants to offset some of the cost of installation, when you applied for a grant you would only be eligible if you had already undertaken all the insulation, double-glazing, changing light bulbs, etc, that would make your house energy-efficient. To receive the FiT you only have to employ an approved installer who uses approved products - you can still have an energy-inefficient house, which seems to me to be crazy. Additionally, the slow bureaucratic process of approving specific products means that there is a persistent time-lag during which new and more effective or efficient technology can't be used, because it hasn't yet been approved. So, it's not perfect . . . nothing in this world is. We need a massive change in personal behaviour, government priorities, global economic structures, infrastructure, lifestyle expectations . . . and so on. It has to start somewhere so, on balance, I think that having solar panels is better than not having them, and the FiT scheme encourages that. A quick ps that I should have remembered to include: if you have this type of work done, you need to tell your house insurance company, as it may affect your premiums. Read your bit in Permaculture and decided to have a look at your blog. Some very sound advice here. The above is rated at 2,467kWh/year and will cost in the order of £11.8k to install. One thing I never factored into the equation is scaffolding.